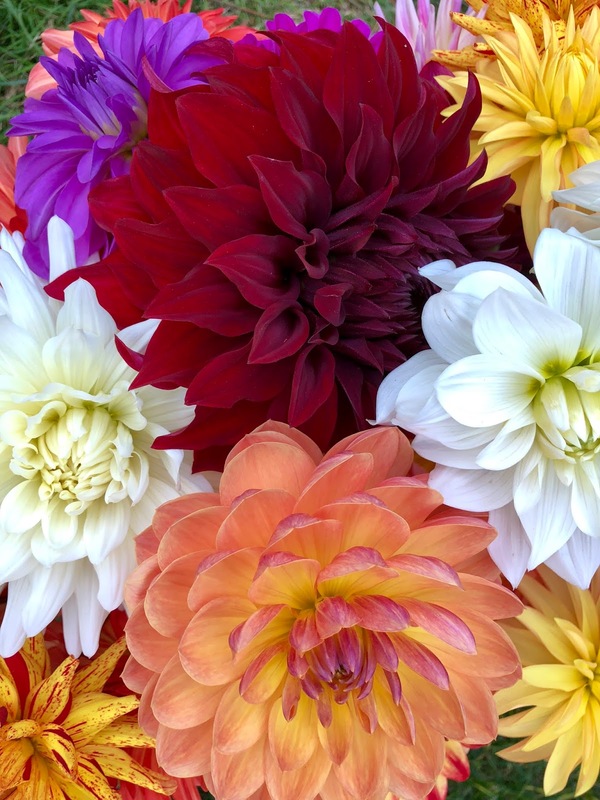 With the warm October-November we’re having, my 100 dahlia plants are still producing lovely blossoms, though the blossoms don’t last as long in a bouquet and the colors are a little faded from peak. On schedule, most of the 4-5’ plants are drooping, browning here and there, and turning silver with mildew, sure signs of autumn decline. Many who dig the tubers up for winter are waiting for a first hard frost that will stimulate a “hardening”, giving them more durability out of ground. 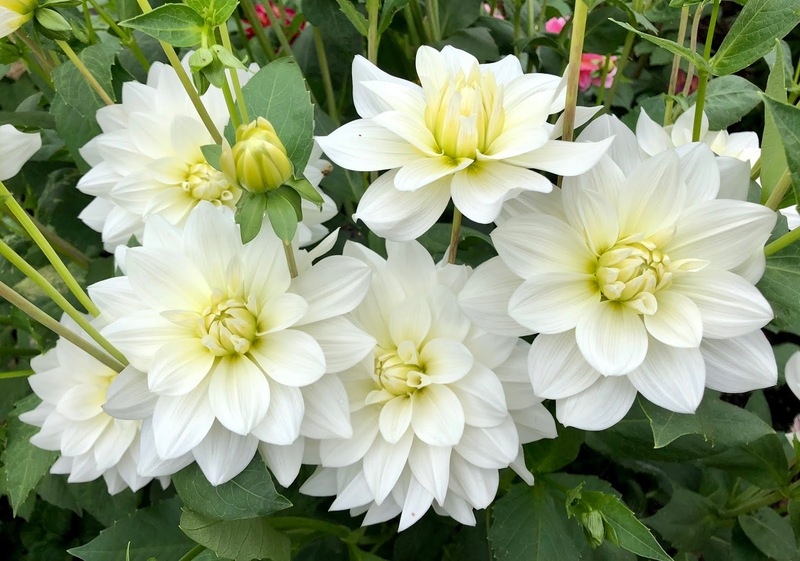 None of this is set in stone – it’s now the usual time to dig and separate and the Puget Sound Dahlia Association took their tubers from the ground in Seattle’s Volunteer Park last Saturday. I just like to wait for a frost; but if one doesn’t come, say, by mid-December I’ll just take them up anyway. Next step after that, for those of you learning to grow dahlias, will be to weed and turn the ground, then cover with about 2” manure that will percolate nutrients down with winter’s drizzle, replacing nitrogen, minerals and vitamins. But enough about gardening! The Dahlias for Seniors 2018 fundraiser was a smashing success! Our best friend and partner, the Ridgecrest Public House (Megan Kogut proprietor), once again sold most of the bouquets delivered between late July and mid-October. Thank you all for supporting your Shoreline –Lake Forest Park Senior Center by buying bouquets! We had so many dahlia-loving followers coming back from last season and snapping up bouquets that in August we added a third weekly delivery to the Pub. And Ms. Kogut, best friend and partner, again matched all donations. In total, drum roll please, the Ridgecrest Pub generated $1500 this year for the Senior Center! With S-LFPSC management consensus, I decided to try a first this year -- selling the dahlias for donations from the Senior Center’s reception desk. I stocked extra vases, buckets, plastic bags, rubber bands, flower preserver -- and wondered what would happen. I’m thrilled to say the dahlia blossoms sold so well from the Senior Center I again needed to add a third weekly delivery. With much help from Senior Center volunteers we sold another $1100! Our grand total raised comes to $2600, a personal best. Thank you so much to all flower lovers, Center personnel, Megan and the RPH, my social networkers, and the Shoreline Area News. We have a thriving Senior Center in Shoreline. It’s full of interesting people weekdays, especially around lunchtime-midday. If you haven’t visited, please do; and perhaps have a rewarding conversation or two. Or play ping pong. Or learn to knit. Or hula. Or get free financial counseling. You get the picture. 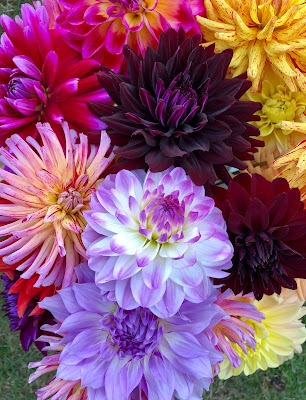 See you next dahlia season!